The last day of the month. Where has September gone? I must confess to being rather preoccupied this month, with no time to read or write. Even gardening took a back seat. We created mayhem by ripping out built-in wardrobes and painting the floorboards in our bedroom. In the midst of this mess, we took a week’s holiday in, what I always used to consider, sunny Suffolk – a wet week that, thankfully, didn’t dampen our fun. And, of course, the rugby World Cup has started! But enough about me! We have restored order and I have rediscovered my clothes, that have been buried for the past month. I am now able to change my shoes! So I can turn my attention back to the garden. I’m afraid the scent in the garden this month hasn’t been overly exciting. Mainly stragglers and single blooms. One chocolate cosmos flower, and a single Jasmine bloom, still able to pack a perfumed punch. 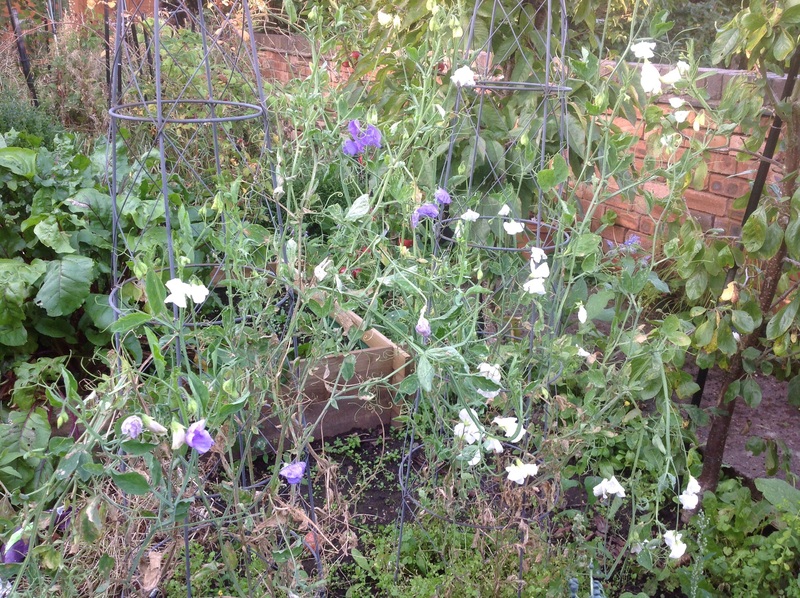 The sweet peas in the allotment are still flowering away, as are the night scented stocks in the pergola pots. That’s one thing about annuals – they do flower forever! The Trachelospermun jasminoides is still going strong, too. It’s done so well. Sadly, my Clethra “Hummingbird” is showing no sign of flowering this year. 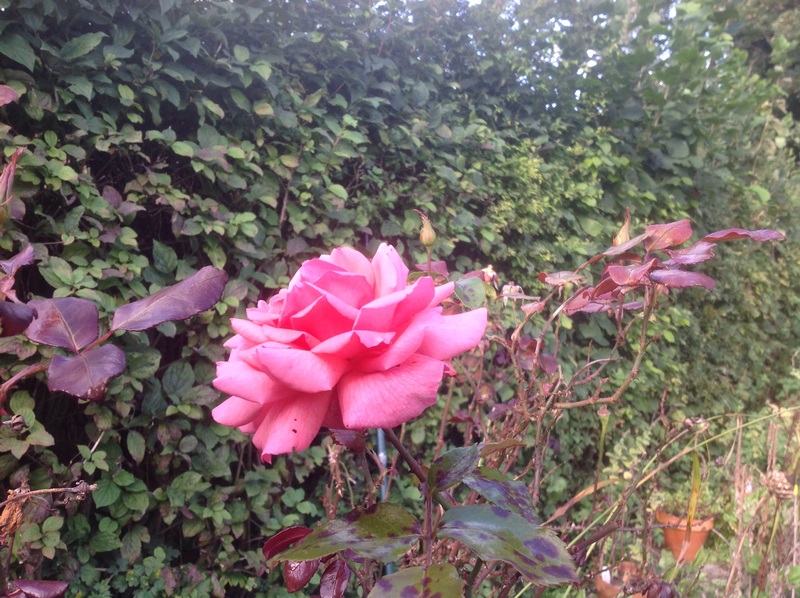 I moved it from its pot and planted it in the Scented shrub border, to fill a gap in the flowering period. I thought I was doing it a favour, but obviously not. It is supposed to cope with shade. 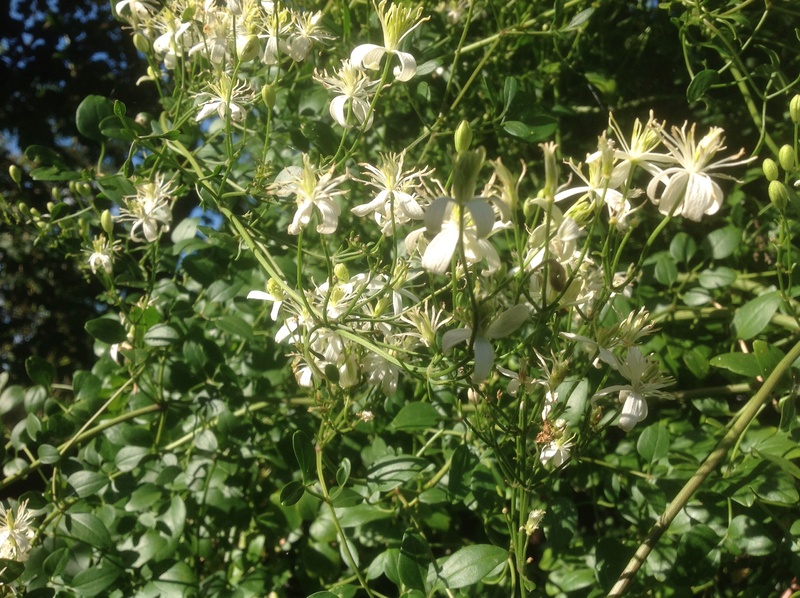 As for my Clematis rehderiana, which is romping away through the surrounding shrubs, it is still not blessing us with its lovely, lemon bells. I’m still waiting to experience its cowslip perfume. However, another clematis, Clematis flammula, pictured at the top of its post, has not let us down, and is rewarding a sniff, with a hint of hawthorn. I’m just waiting now, for its partner, Lonicera “Belgica”, to join it. There have been some new blooms this month, though. 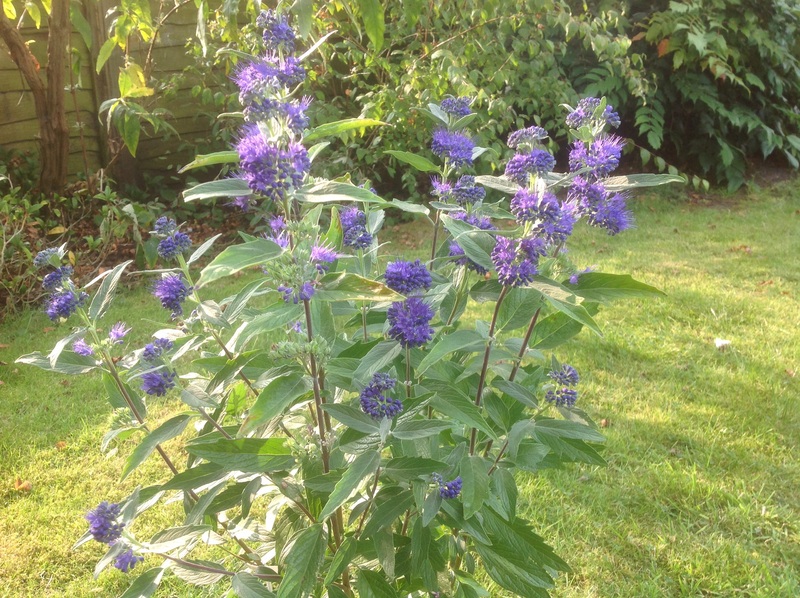 Caryopteris clandonensis, with its fluffy, clear blue blooms, is in flower. Mind you, it’s not the flowers, but the silvery leaves that are scented – like mint a bit, when they are rubbed. This poor little shrub seems unfazed by still being in its pot, awaiting a rethink of the border. I feel many of the shrubs are under performing and a revamp may have to be considered. I suspect removal of the problematic ash will be needed! 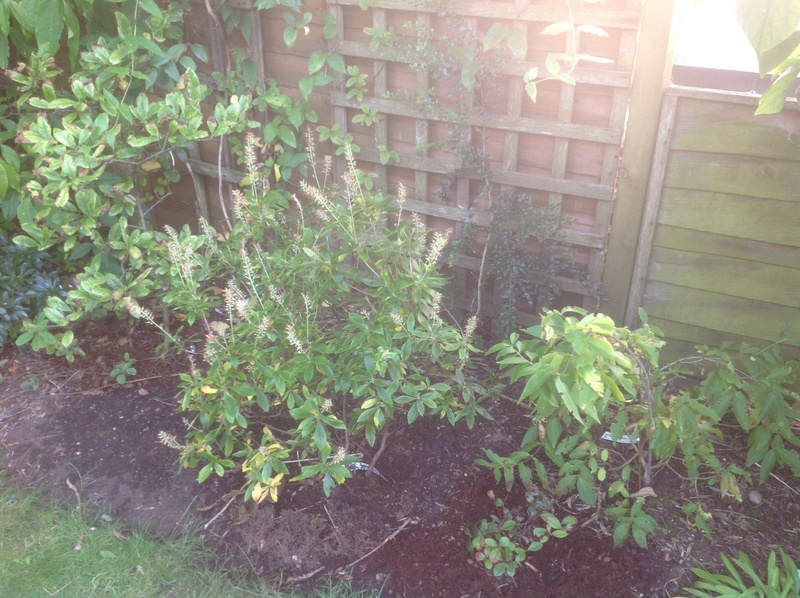 Scent was also provided by a new shrub I bought – Cestrum parqui. Not the most pleasant perfume from the leaves during the day, but the perfume when night falls, is lovely and heady! Its flowers are tiny lime green tubes, but they were short lived by the time I bought it, so I wasn’t able to get a photo. It can be tender so needs to be protected during cold spells, so is awaiting a container. Hopefully, I will be able to appreciate it for longer next year. And that’s it! I wonder what next month will hold? How does your garden smell? Do share with us! It would be lovely if you could join in. I love seeing scented plants! Thanks to Wellywoman and Backlane notebook for starting this off! I will end with an apology – for being late again, but better late than never! This entry was posted in The Scented Path and tagged Caryopteris, clematis, Roses, sweet peas on September 30, 2015 by thelonggardenpath. Come In and Have a Catchup! I’m sure we’ve all been lapping up this late summer weather. I certainly have! I’ve been “busy” walking round the “Estate”, appreciating and taking stock. There’s not too much of great urgency to do – just “pottering” – so it’s a good time of year, at the end of the summer, when things are settling down for the winter nap, to review the good and bad points, and take notes for next year. The “Grass garden” this year, has had an explosion of growth and colour, but I fear that the grasses may be getting a bit crowded out, in the process. So that has been earmarked for a bit of readjustment next spring. I don’t want to tackle that now. I want to be able to appreciate the grasses and seed heads, in all their winter beauty. The day’s task, however, were my two Fothergillas, that had recently been moved. They seem to be struggling. Fothergilla major is obviously in a far too dry and shady position, while its smaller, blue-leaved cousin is positively sulking. So out went the Viburnum opulus, with such a viburnum beetle problem, that its leaves were like cobwebs by summertime. No flowers, means no fruit and, as for autumn colour? Well, you need leaves for that! The Fothergilla was more deserving of its more open position. So we shall see how it fares, with a bit more sun and water. No more droopy leaves! The truculent Fothergilla major “Blue Mist” is a much smaller specimen, growing only to 2-3 ft high, with beautiful glaucous leaves. They both have lovely scented bottle brush flowers in springtime. The solution? 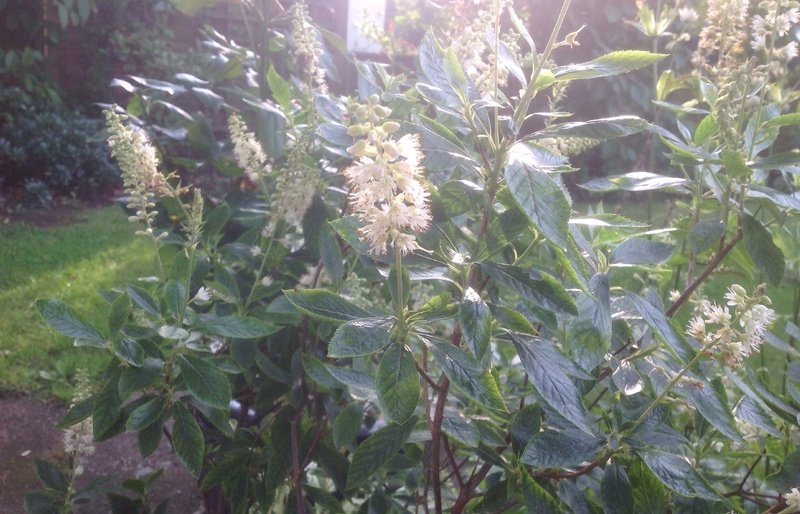 I have another lovely scented shrub growing in a pot, Clethra alnifolia “Hummingbird”. My thinking is that, as it grows taller than the Fothergilla, it may be better suited to its inclusion in the Scented shrub border, where it would fill a gap in the flowering calendar. 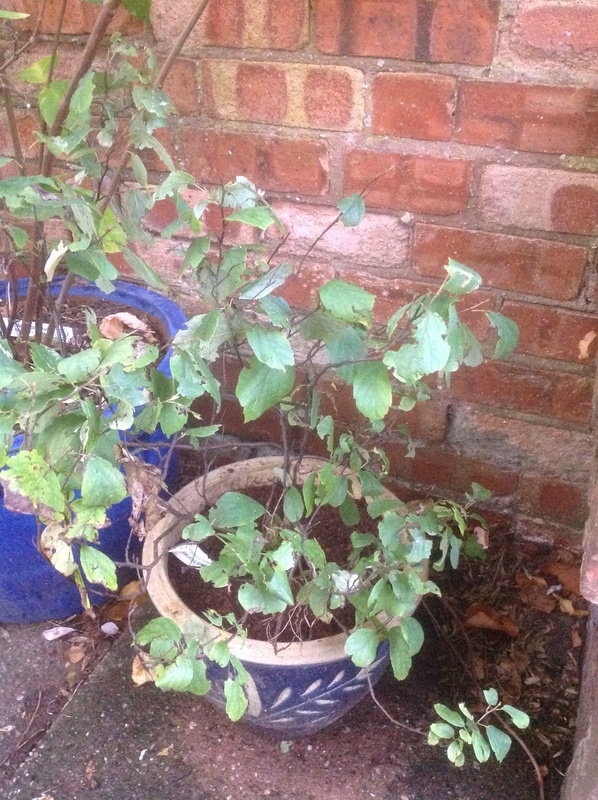 The Fothergilla could then be rehoused in the, now vacant, blue glazed pot, which would set of this plant’s lovely blue foliage beautifully. It would also allow it to be grown in the ericaceous compost it prefers. So it would have to snap out of its sulk, now that it’s been pandered to! I also planted up one of my latest acquisitions – Daphne x Napolitana “Meon”, a dwarf variety for a small gap in the scented shrub border, again with the plan of flowering at this “in-between” period between summer and autumn’s fragrant flowers. At a final height of only 18 inches, with tiny rose-pink flowers, it may be small in stature, but not in perfume. 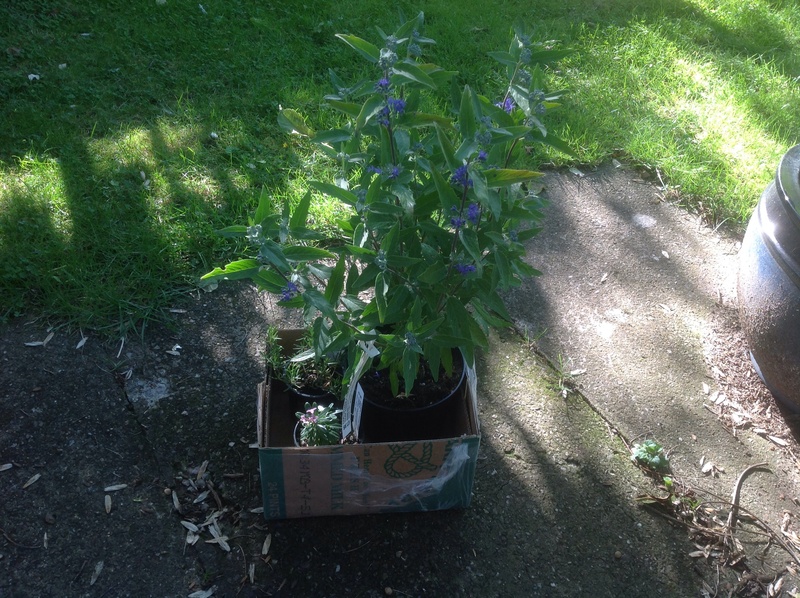 The other purchase, the Caryopteris, with its lovely aromatic glaucous leaves, and dark indigo blue flowers, is destined for the front garden, as it will need more sun, but as yet, it’s final position is undecided. That will need to wait for a bit longer. That was the some total of the day’s “tweaking”. The rest of the day was spent appreciating, so let me share with you! 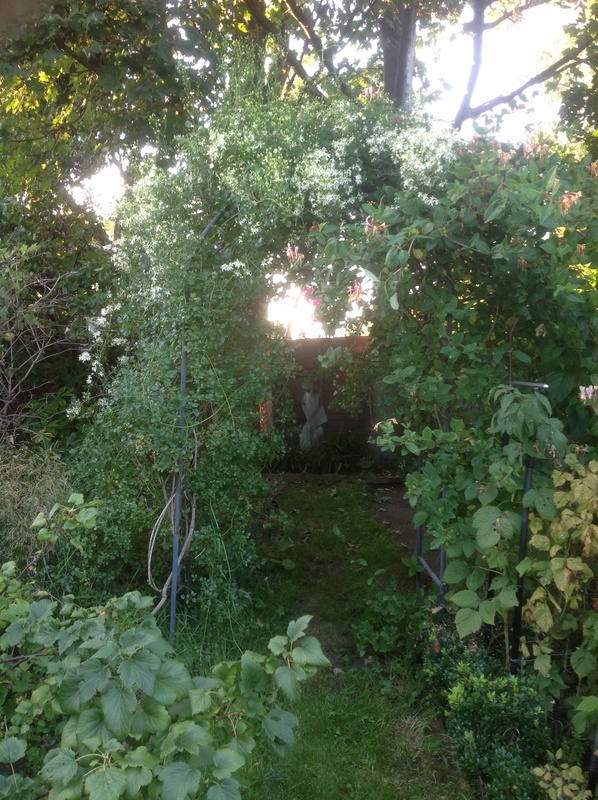 If you took notice of the archway, (at the start of the post) you can see it’s smothered in two different climbers – Clematis flammula and Lonicera belgica. I’ve been watching patiently for the clematis to start flowering, hoping it would coincide with the honeysuckle’s second flush. And it has come off! Just! 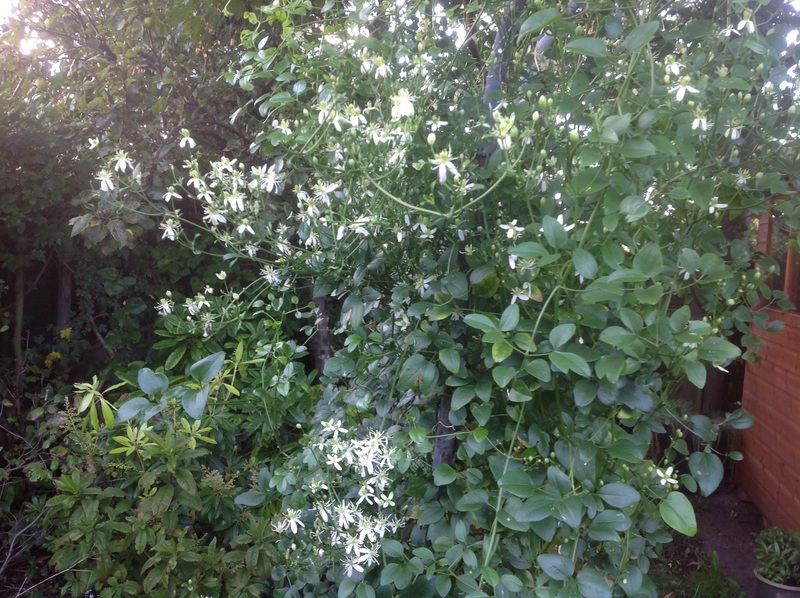 This is a very vigorous group 3 clematis, which means it flowers on new wood, so is easy to prune, by cutting hard back to about a foot from the ground, and it will make all this growth, in one season. It’s smothered in tiny white, starry flowers at this time, that smell of hawthorn. In fact, the arch, for a split second, can become a time tunnel, transporting you back in time to early summer! This has to be one of the best summer scents in the garden! 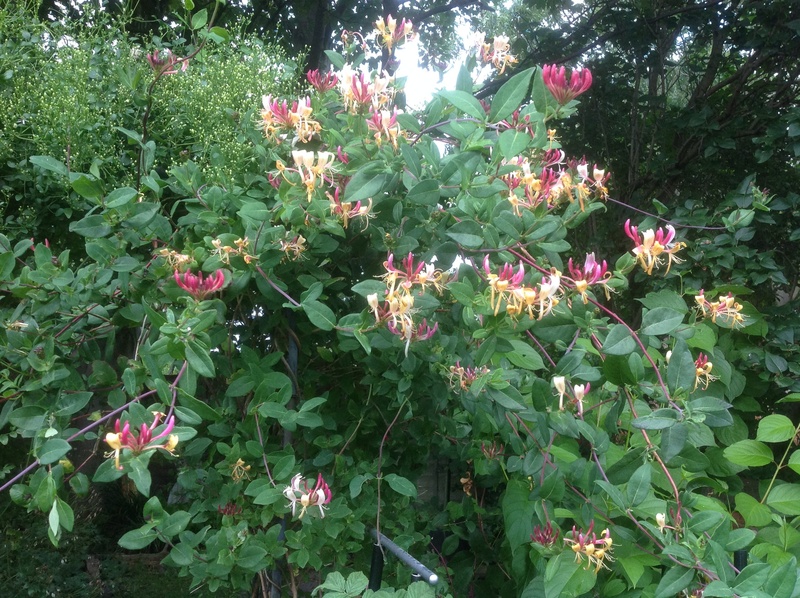 Lonicera belgica may be “commonplace” in our gardens, but its gorgeous scent, and unusual flowers with their lovely colouring, makes it seem exotic in my eyes. Sadly for us, its main flush of flowering early in the summer, amounts to nothing. 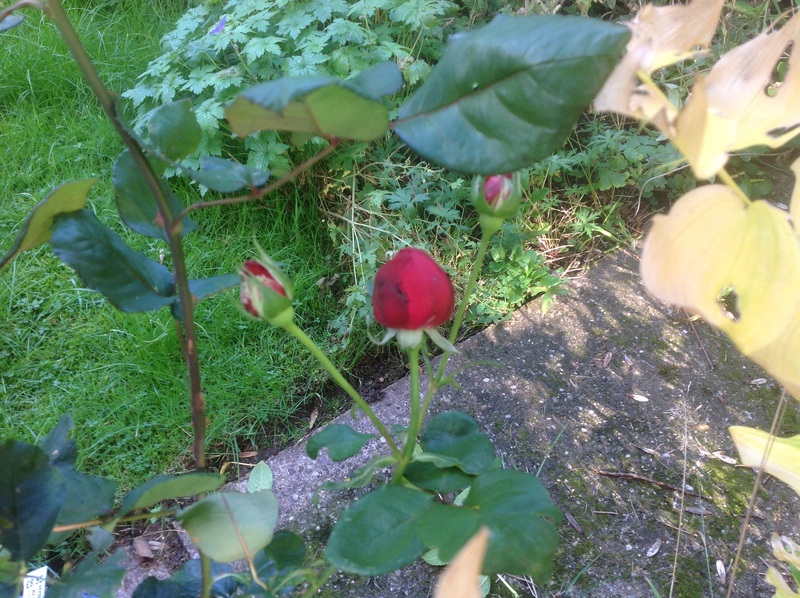 The buds can cover the climber, but as they open they wither and die off. I believe it to be an infestation problem rather than cultural, as it’s second flush at this time is magnificent! I haven’t yet identified the culprit, but it’s found every one of the four plants we have in various places in the garden. Never mind, we can enjoy it now! The recently transplanted Clethra is a lovely shrub, not often seen, I believe. This variety is a more compact variety than the species, growing to 3-4 ft. and it has the advantage of coping well with our shady conditions. More importantly, it flowers at a time when few other scented shrubs are in flower. It’s also known as the “Sweet pepper bush” and has sweetly scented bottle brush flowers, during August. It has gone over now, but its autumn golden yellow colouring is just starting. I must say, that what our scented shrubs lack flower wise, at this time of year, is made up for with some magnificent autumn colouring. If the Clethra was unknown to you, what about this? What a mouthful that is! This is a beautiful shrub, with pure white new stems and glaucous, oval leaves. If you look closely, you should make out the small bell-shaped, pure white flowers, that look like lily-of-the-valley. They don’t smell like them though, having instead, an aniseed perfume. It is actually an ericaceous shrub, semi-evergreen, that grows to about 5-6ft. but is happy in a pot. And this blue glazed pot, I think, is perfect! Well, I think that’s it for now. It’s now time to switch our attentions to the beauty of autumn, that lies round the corner. This entry was posted in The Scented Path and tagged Caryopteris, clematis, Clethra, Daphne, Fothergilla, Garden scent, Lonicera, Scented shrubs, Zenobia on September 19, 2014 by thelonggardenpath. 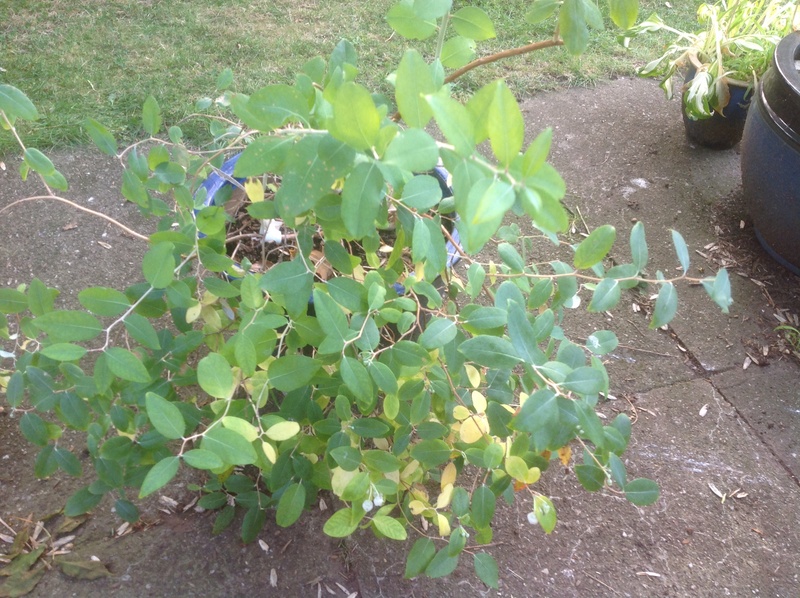 I went to Ashwood and …..
….added to my scented shrub collection! I was seeking out a scented shrub in flower now, as I was aware of a flowering gap in my scented shrub border. 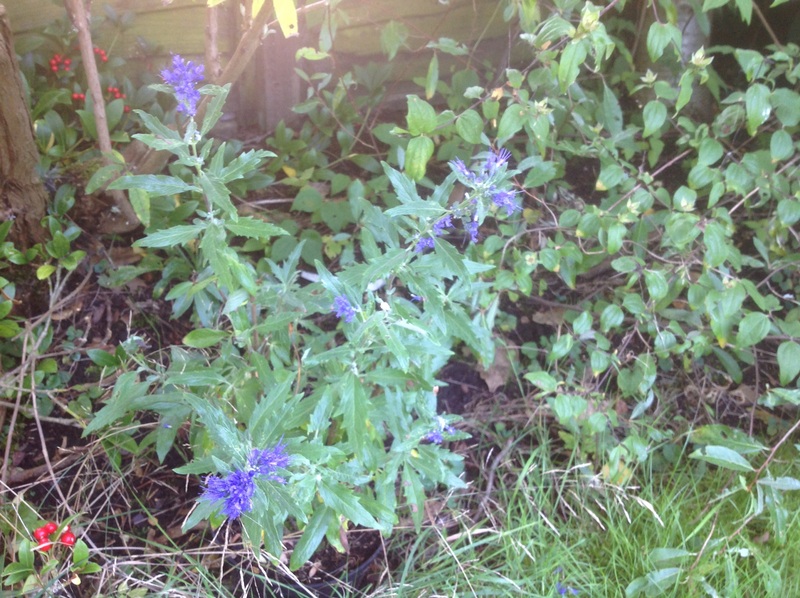 I was thinking of possibly a Caryopteris, which blooms at this time, but it prefers a sunny position, and our border is predominantly shady. I was open to options. The nursery had a wide selection of Caryopteris available, and I succumbed, choosing Caryopteris x Clandonensis “Dark Knight”. This variety has the usual silvery-blue foliage, that is strongly aromatic, and the flowers are a lovely deep blue. The bees just love them! It was even obvious in the nursery – they were all over them! I know! I said the Scented Shrub border was in shade! I’ve decided, that to increase my repertoire and accommodate more sun lovers, it’s time to extend, and the only other sunny area available is the front garden. So that is going to become “Phase 2”. There’s still the gap in the display in the border in the back garden to solve. On the way out, there was a display of miniature Daphnes, several of which were either flowering or about to. I saw one – Daphne x Napolitana “Meon”. That would fit the bill! A small, scented shrub, reaching only 10″ x 18″, that had only 3 tiny rose pink flowers on it, but was still pumping out a very tempting scent even on this small scale. An impulse buy, well justified! And a small pressy for my mum! She has been on the lookout for a prostrate Rosemary, so when I saw one I had to treat her. This entry was posted in I went to Ashwood and..., The Scented Path and tagged Caryopteris, Daphne, Scented shrubs on August 31, 2014 by thelonggardenpath.